Filipino cuisine has been sweeping the culinary world by storm. I love trying out different flavors and when I got The Filipino Cookbook by my Miki Garcia, I couldn’t wait to try it out. The cuisine is bright and friendly just like Filipino culture, and I loved that this book makes it easy for anyone to create Filipino dishes even if they’ve never tried this type of cuisine before. It always feels a bit mystifying when stepping into a new cuisine, and this cookbook does a fantastic job of keeping you assured and confident in the kitchen. I decided to try the chicken adobo first because I was fascinated with the technique. In warmer climate, it’s very common to find methods of preserving food. 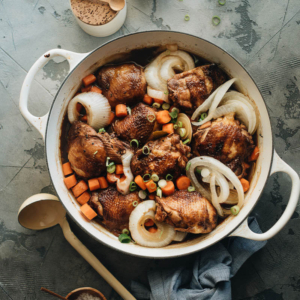 Vinegar is an excellent way to keep bacteria away which is why Filipino natives turned to this method of marinating to keep meats from spoiling. Chicken adobo is also one of the most popular dishes in the Philippines. Luckily, we don’t need our passports to get an authentic taste of the flavors today! 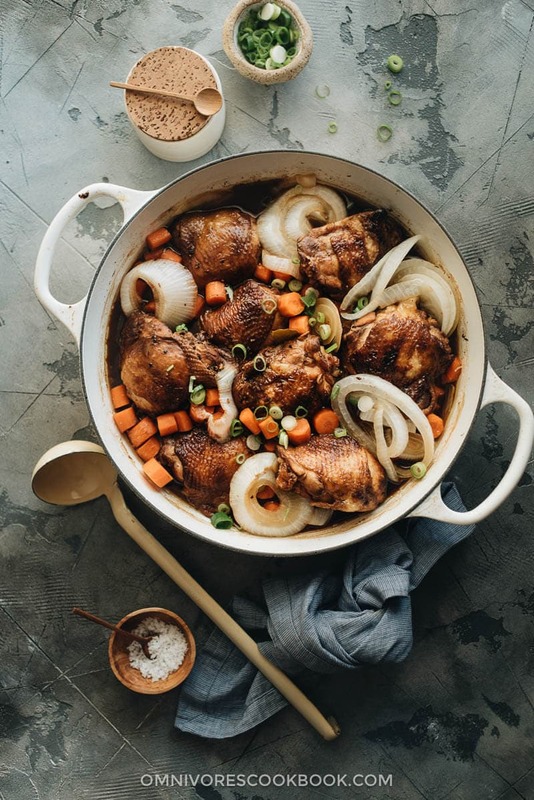 Traditionally, chicken adobo (as well as other types of adobo) were cooked in clay pots, but you can use cast iron, enameled cast iron, or stainless-steel pans instead. Whatever you do, don’t use aluminum because the vinegar reacts chemically with it and it changes the taste. Along with vinegar, the marinade recipe includes soy sauce, bay leaves, garlic, black peppercorns, onion, and brown sugar. It’s important to note though that the type of vinegar makes a difference. You should try to find Filipino cane vinegar to completely match the authentic flavor. 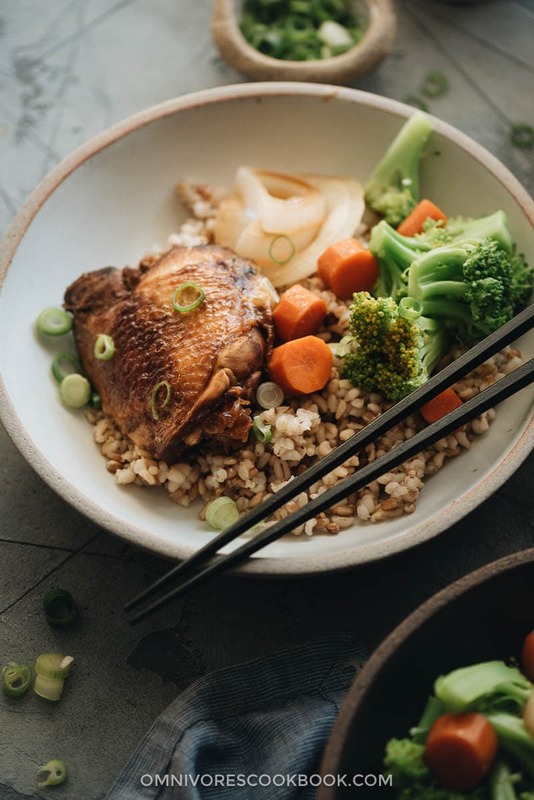 If you’re not able to find it at your local Oriental market, you can use white vinegar or cider vinegar, but you must dilute them with water. To match the cup of vinegar, you’ll need to add 2 cups of water. Marinating it is the key to matching the true taste of this dish. 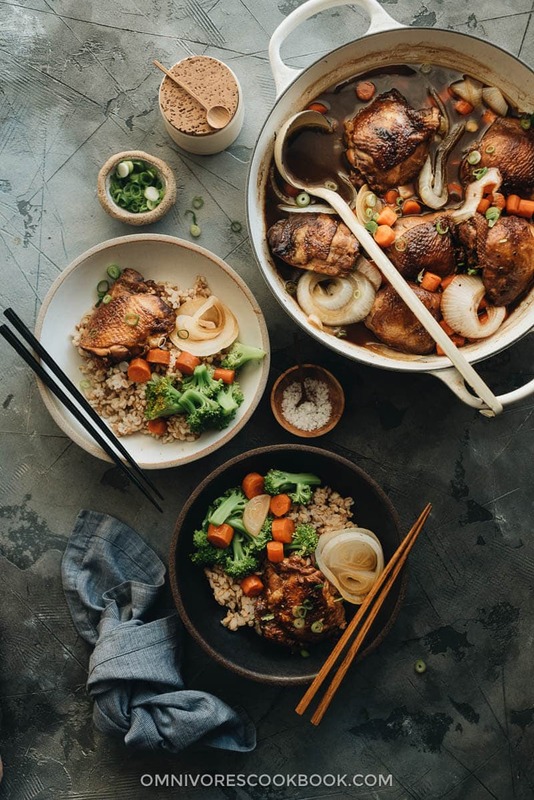 Simply preparing the marinade and allowing the chicken to absorb all the flavors of the ingredients mingling together is really all it takes to get real chicken adobo in your kitchen. At the end, I love to add a handful of vegetables to make the dish more colorful. Serving it over a bed of fluffy white rice is highly recommended to get the most of this delightfully delicious and tangy sauce. 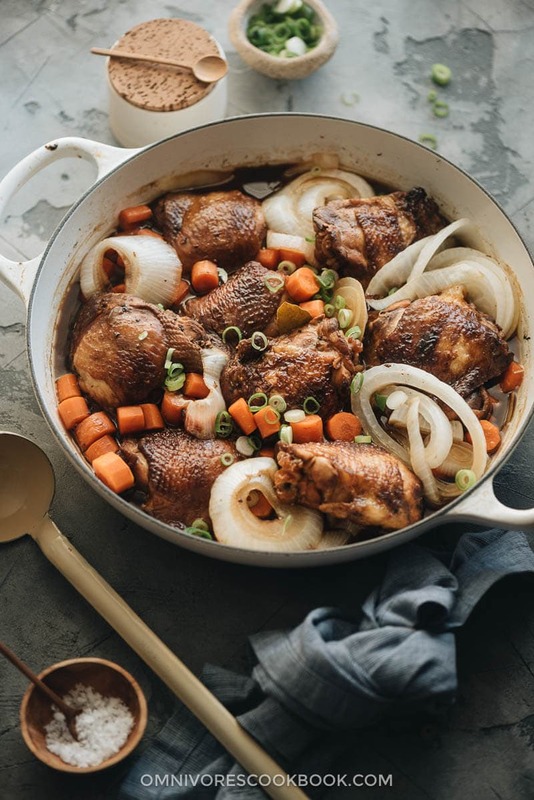 Once you perfect this technique for making chicken adobo, you can try it with other meats like pork, beef, or even seafood! Combine the marinade ingredients in a large ziplock bag. Add chicken and shake to mix well. Squeeze out as much air as possible and seal the bag. Let marinate in the fridge overnight. When you’re ready to cook, remove the chicken from the marinade and place on a plate. Reserve the marinade juice. Heat oil in a large nonstick skillet or a dutch oven over medium heat until hot. Add the chicken, skin side down. Cook until browned, flip to brown the other side. It takes about 10 minutes in total. Add the reserved marinade liquid, garlic, whole black pepper, brown sugar, and bay leaf. Bring to a boil then turn to medium low heat. Cover, simmer, until the chicken turns tender, 40 minutes for well-done chicken. Or up to 60 minutes for falling-off-the-bone chicken. Add the onion rings and carrots. Cook uncovered for another 5 minutes, until the vegetable turns tender. Serve hot as a main dish with steamed rice. The recipe is slightly adapted from The Filipino Cookbook by my Miki Garcia. Authentic chicken adobo does not contain this vegetable, but I love to add some veggies to make my fish more colorful. You can skip it, or use other veggies as substitution, such as potatoes or broccoli. Maggie – I am drooling reading this. This is perfection. I’ve got to find that filipino cane vinegar. There is a filipino market down the street from me, so I’m sure I can get it there! As a filipino chinese, what we do is add some potatoes and a teaspoon of 5 spice powder. It adds a twist to the normal adobo. Glad to see this one. Cheers! You seem to have forgotten to add the carrots to your instructions. Where would you add them — along with the onions, or with the rest of the ingredients in step 4? Thanks so much for letting me know! Just updated the recipe. You should add the carrots with the onions.